When outdoors and practicing mindfulness your are engaging your body's Automatic Nervous System (ANS) and this can be taken a step further into your Sympathetic Nervous System (SNS) and the Parasympathetic Nervous System (PNS.) Now to stop the technical jargon simply put the SNS is like your accelerator pedal in a car, it activates your fight and flight responses and the PNS is like your brake pedal, it activates your rest and digest systems. Breathing is an example of both systems working harmoniously together. Breathing IN is the SNS - accelerator and breathing OUT is the PNS the brake system. Both of our systems work perfectly together when in balance. When we experienced anything that takes us away from balance, both systems work very hard to recover that balanced state. However, if we constantly experience an out of balanced state - our ANS starts to reset slightly off centre. This can be like a spiral affect. Each time we can not reset back to base we set a new norm that is slightly out of balance. This is how we can start to set up an anxious state as our norm. I will take you through a guided mindfulness experience that will bring awareness to all parts of your internal and external body. This awareness will allow you to start to learn to reset your ANS system. 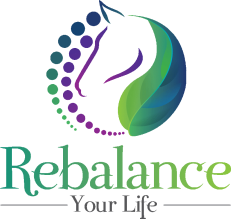 ​The horses help with this process by showing you visually the changes that are happening inside you. As you learn to relax and breath deeply you will notice the horses respond in kind. (They will act as your mirror.) This allows for a quick and direct link from you body to your brain. All systems benefit. Watching the horses response helps to anchor that peaceful state into your mind. You can also recall that image to bring back all the benefits to that balanced state especially if something in your environment has caused a temporarily out of balanced moment. This imagery in your mind is very powerful and influential.